Through the murky streets of Arkham, unnatural gates are opening to connect our world with strange other dimensions. Out of the depths of these eldritch pathways have begun to crawl profane creatures that even now haunt the innocent, dragging away the unwary and causing havoc on silent midnight streets. At the epicenter of this living nightmare roil whispers of arcane magic cults, ancient family secrets, and a truth too terrible to behold. Join as one of a team of intrepid investigators committed to rooting out these otherworldly portals before an ancient evil reawakens, bringing its ancient horror back to destroy the world as we know it. Welcome to the horror of 1920’s Arkham, Massachusetts! The Lurker at the Threshold is the newest boxed expansion set for Arkham Horror, the classic cooperative board game for 1-8 players, set in a world of gothic horror created by author H. P. Lovecraft. This expansion will bring new levels of dread to your table top, with the addition of a brand new Herald Sheet for „The Lurker at the Threshold“ – a powerful and malevolent being that has appeared to prepare the way for the Ancient One, plus more than 200 components and some extraordinary new game mechanics to boot. One of the highlights is the full set of 18 Gate markers that are designed to replace those from the Arkham Horror core set, as well as those from The Dunwich Horror and The Kingsport Horror. They are treated exactly the same as the previous Gate markers, except that each Gate now has an additional characteristic. For example, the „Gate of Madness“ will cause an investigator to lose one Sanity when they fail to close the Gate, and a „Moving Gate“ that can move along with monsters during the Mythos phase. Brand new to The Lurker at the Threshold are Relationship Cards for use in games with two or more players. Each player draws one Relationship Card at the start of the game, which describes some advantage gained due to how the investigator to your left is related to you. Perhaps you are business associates and mutually reap the benefits of income, or both are Students of the Arcane and gain more frequent access to the Spell deck. No matter how you’re related, these will bring a more interesting back-story to your game, involving your characters in more interesting ways than ever before. Finally, The Lurker at the Threshold introduces the Dark Pact deck which will tempt foolish investigators to enter into a terrible arrangement with the Lurker itself. Although these Dark Pacts may grant your investigator enhanced abilities, there is sure to be a cost. What happens when the price too high? Of course with over 100 new Location cards, Mythos, Gate cards and Spells, plus more Common and Unique Items, The Lurker at the Threshold will enhance and expand the enjoyment of Arkham Horror for players of all skill levels, and is coming Spring 2010. Arkham Horror is a board game of mystery and madness set in Arkham, Massachusetts in the 1920’s. Players investigate the strange happenings about the town and race to prevent ancient evil from surfacing. Playable with 1-8 players. 56 new Investigator cards, including new items, new spells, Relationship cards, and horrific Dark Pacts made with the powers beyond! Wenn es darum geht Geld zu verdienen hat Fantasy Flight Games die Nase im Brettspielbereich weit vorne. Für Arkham Horror gibt es jetzt bemalte Plastikminiaturen. Immer 2 Stück pro Packung und eine Packung im Monat bis alle Helden aus dem Brettspiel vorliegen. Natürlich können die Miniaturen im 32mm Maßstab auch für das Rollenspiel zweckentfremdet werden. Massachusetts seaport of Innsmouth. The public first learned of it in February, when a vast series of raids and arrests occurred, followed by the deliberate burning and dynamiting – under suitable precautions – of an enormous number of crumbling, worm-eaten, and supposedly empty houses along the abandoned waterfront. Few souls have the bravery and courage to interfere in the machinations of the Ancient Ones. These Investigators risk their very minds as they seek to unravel the lies and hidden plots put into motion by the malevolent evil. Every game is another chance for them to prove their mettle, and every game is another chance to be removed from this plane of existence. As the hills draw nearer, one heeds their wooded sides more than their stone-crowned tops. Once across, it is hard to prevent the impression of a faint, malign odour about the village street, as of the massed mould and decay of centuries. It is always a relief to get clear of the place, and to follow the narrow road around the base of the hills and across the level country beyond till it rejoins the Aylesbury pike. Afterwards one sometimes learns that one has been through Dunwich. Over the coming months, Investigators will be fighting against the madness like never before… in 3d! 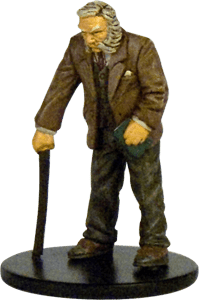 FFG is proud to announce finely detailed, pre-painted plastic Investigators! Our first wave is the tenacious professor, Harvey Walters, and the jet-setting Jenny Barnes. Both of these Investigators see a lot of table time, and the new expertly-sculpted, pre-painted plastic figures will let you immerse yourself in the madness like never before. Every Investigator, from Arkham Horror all the way through Innsmouth will make their appearance in superb detail. From “Ashcan” Pete’s guitar and four-legged travel companion to Michael McGlen’s cigar and tommy gun, every figure is ripped straight from the art you have come to know and love. He knew his room was in the old Witch-House – that, indeed, was why he had taken it. There was much in the Essex County records about Keziah Mason’s trial, and what she had admitted under pressure to the Court of Oyer and Terminer had fascinated Gilman beyond all reason. She had told Judge Hathorne of lines and curves that could be made to point out directions leading through the walls of space to other spaces beyond, and had implied that such lines and curves were frequently used at certain midnight meetings in the dark valley of the white stone beyond Meadow Hill and on the unpeopled island in the river. She had spoken also of her oath, and of her new secret name of Nahab. Then she had drawn those devices on the walls of her cell and vanished. Cast in 32mm (compares to 28mm „heroic“ scale) 3to showcase the fine details, these hand-painted figures give new life to ancient horror. Over the coming months, the Mythos will reveal the next waves of Investigators. Keep your wits about you, and your eyes sharp for the coming assistance. Each pack of 2 investigators will retail for $12.95. 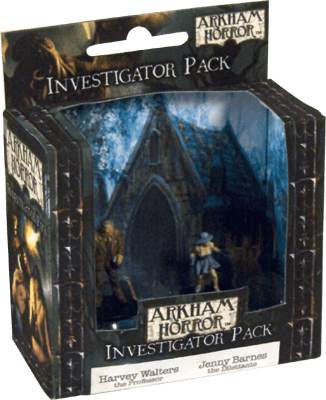 Frequently Asked Questions about the Arkham Horror Investigator Packs. A: Miniatures are very expensive to produce in niche quantities. A similar single figure of metal (pewter) would retail for about $9.95. Instead we are excited to provide 2 high-quality detailed figures, masterfully painted, for $12.95. The eldritch ones expected nothing less. Q: Why only 2 per box? A: Placing more figures in a box would have caused the product to become prohibitively expensive. 8 Figures, for example, would have retailed for about $45 with customers being forced to purchase a bundle of 8 figures rather than the figures of choice. We expect to see retailers selling „bundles“ of these figures at competitive prices, which will provide the solution for customers looking for larger sets. Q: Doesn’t the extra packaging (2 figures as opposed to more) add a lot to the retail price? A: No, this is near negligible. FFG will print the same packaging for all the investigator packs in volume for cost efficiency, which we can pass along to the customer. Q: What is the size of the box? A: The box is about the size of a „Wings of War“ miniature airplane box. Q: How often will these investigators packs come out? A: Once the first pack hits the street, the packs should be coming out at a rate of about one per month until all the investigators are out. Q: Can I use these for my „Call of Cthulhu“ role playing game? Während die Arkham Horror Erweiterung Kingsport Horror Anfang Juni auf englisch in Deutschland erhältlich war, ist es jetzt soweit. Der Heidelberger Spieleverlag hat die deutsche Übersetzung fertiggestellt. Ab sofort is die Erweiterungsbox bei den üblichen Verdächtigen zu beziehen. Der Preis schwankt zwischen 25 EUR und 40 EUR. Und weil wir gerade bei den Mails sind, die folgende hat mich gerade eben erreicht. es wird sicher noch updates udn weitere infos geben. zb ist geplant auch noch was zum neu erscheinenden Warhammer Invasion LCG zu machen. natürlich wirds auch FFG brettspiele geben. gerne werden auch emails entgegengenommen. hoffe wir sehen uns dann dort! Also wer Lust auf Collectible Card Games, insbesondere Cthulhu hat, der sollte mal einen Blick riskieren. Ganz aktuell hat FFG die neueste Erweiterung für Arkham Horror auf den Markt gebracht. Innsmouth Horror.